﻿ Suites Universitat Apartment, Barcelona | FROM $104 - SAVE ON AGODA! 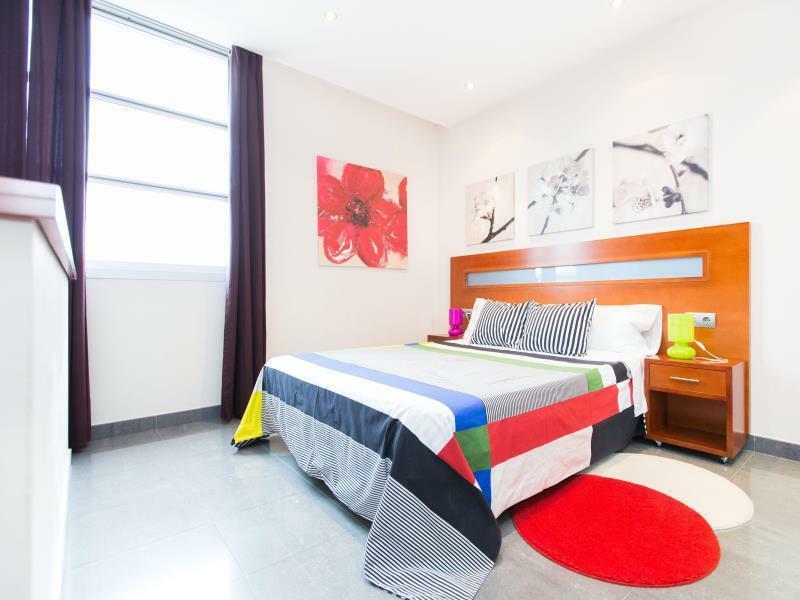 "Great location Good facilities Had a great stay Would really..."
Have a question for Suites Universitat Apartment? Whether you're a tourist or traveling on business, Suites Universitat Apartment is a great choice for accommodation when visiting Barcelona. From here, guests can enjoy easy access to all that the lively city has to offer. With its convenient location, the hotel offers easy access to the city's must-see destinations. Offering hotel guests superior services and a broad range of amenities, Suites Universitat Apartment is committed to ensuring that your stay is as comfortable as possible. The hotel offers access to a vast array of services, including 24-hour room service, free Wi-Fi in all rooms, express check-in/check-out, luggage storage, Wi-Fi in public areas. Step into one of 8 inviting rooms and escape the stresses of the day with a wide range of amenities such as television LCD/plasma screen, internet access – wireless, internet access – wireless (complimentary), whirlpool bathtub, non smoking rooms which can be found in some rooms. Besides, the hotel's host of recreational offerings ensures you have plenty to do during your stay. 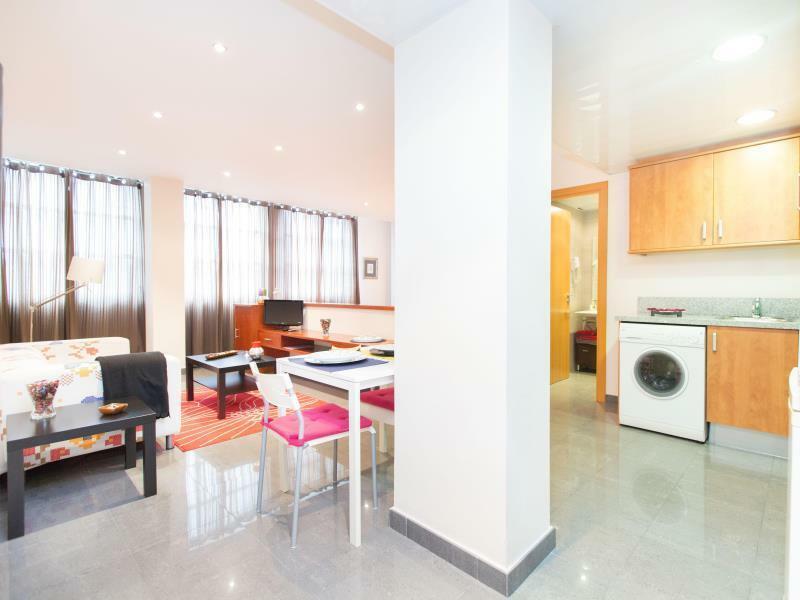 Enjoy unparalleled services and a truly prestigious address at the Suites Universitat Apartment. "Really loved the location as I could walk almost anywhere an..."
We arrived on site but couldn't see any sign of the apartment. The adjoining hotel staff was helpful and showed us how to buzz the apartment. Then we carried our luggage three stories up but were told the actual apartment was actually two blocks away??? Staff didn't want to go with us to the actual apartment but ended up going after we insisted but she was complaining the whole way. The apartment was a studio with broken shower door and no shampoo nor conditioner. Very awful experience. Matress and pillows were not good! I'm not quite sure if all AnBs are set up this way, but where you check in is a block away from where you stay. And when you walk in torrential rains, it's not a good thing. Checkin - straight forward and sort of polite. Walked me to the apartment, but mentioned multiple times it's not the usual case. Room - nice layout though technically I would call it a studio. Quite spacious and had everything an apartment needed. The only minus was I found a hairs on the bedsheets and a white crusty stain on the duvet. It only has a microwave, but there are plenty of places to eat in the area. Small fridge and washing machine was a bonus. Location - Perfect. If you catch the aerobics or metro it will drop you off at Universitat which is 20 second walk from the main doors. Your a couple of blocks away from Plaza Catalunya, MACBA, Vasa Batllo and Mercat De Boqueria. Really loved the location of the apartment. However does not look like the pictures in the websites. Bed is very hard and does not feel very homely inside the apartment, no carpets or rugs. Only three of the channels on the tv were in English which is difficult for a solo Traveller to feel comfortable alone. Really loved the location as I could walk almost anywhere and plenty of good cafes, restaurants and supermarkets around. It took me some time to locate the apartment as there is no signage outside the building. You have to search by its address and communicate with the landlord via an external door bell. Room given was located in another building (~5 mins walk). Room is spacious and self-sufficient. However the utensils are used and limited with no cleaning tools. Corridor light is timer control and dark at night. Safety concern. 별로입니다 전체적으로 사진과 같은 방은 아니구요,위치도 역시... 어렵게 헤드 오피스 찾아서 집(방)을 배정 받았는데,다행이 고딕지구의 좋은 위치라 만족스럽기는 했지만,복불복이라 다름분도 그럴지는 알수가없음. 바르셀로나 호텔가격이 호텔의 시설이나 청결에 비해 너무 비싼데.. 광장에서 거리는 좀 있지만 충분히 걸어다닐만 했고 주택가쪽이라 오히려 조용하고 좋은부분이 있었습니다. 또한 공항버스 정류장도 멀지 않았구요. 청소상태도 깔끔했지만 다만 흠이라면.. 욕실의 샤워부스가 넘나 작은것? 뿐이었습니다.ㅋ 그리고 주인이 근처에 없기때문에 급한 도움을 받기는 쉽지 않아보인다는 점입니다.